"I CAN be ready for school!" Readiness is not simply a checklist of skills. It’s a foundation for life and we all have a part to play — parents and caregivers, schools and churches, teachers and coaches. Don’t take for granted the countless everyday ways you can engage with the young children around you and prepare them for school and for life! From read-aloud time and simple routines to playing outside and practicing letters, getting kids ready for school can be part of everyday rhythms. But it does take intention. Knowing what young children need is where readiness begins, and that’s why First Steps is here to help. 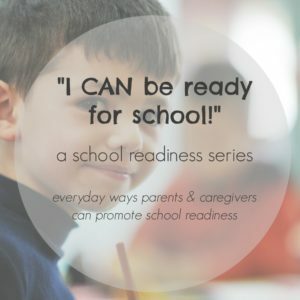 Below are all of the posts in the “[I CAN] be ready for school” series. We hope these encourage you in practical ways and that you’ll share our content with those in your life who are parenting or providing care for young children. It’s a simple way to contribute to the school readiness of all the children in your community! You can also stay up with the latest resources and everyday tips through Facebook, Twitter, and Pinterest.